Sewage vent pipe located in a garden off on a minor road near Kill and Dunfanaghy - see C0136 : Sewage vent pipe, Dunfanaghy. It was manufactured by Adams Hydraulics Ltd. of York - this is the foundry inscription (partially obscured). I can't find too much out about Adams Limited, but they appear to have been involved in the water and sewage treatment industry and may still be trading as Ham Baker Adams / Adams Hydraulics - Link . Clarifications on the above welcomed. 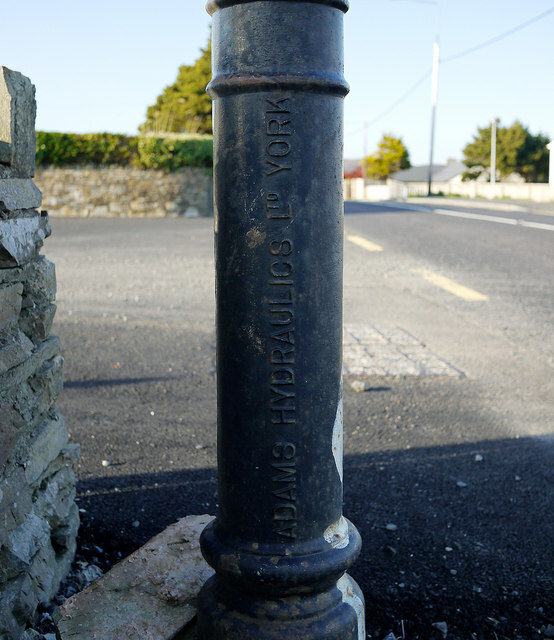 This is one of at least five complete pipes manufactured by Adams that I noticed in the Dunfanaghy area; similar vent pipes in Ireland are listed in "Buildings of Ireland" Link but, at the time of writing, that register does not include Donegal.